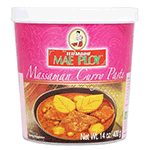 Try this Thai massaman curry paste. This famous Thai curry is rich and very flavorful. It is muslim in origin and can be made with chicken, beef, or lamb. It's a fragrant yellow curry that incorporates lemongrass and nuts together with other key Thai ingredients. Coconut milk is always used in this curry, as are bay leaves (instead of the harder-to-find kaffir lime leaves). Makes a sumptuous dish to serve on a chilly fall or winter night, and leftovers are just perfect for hot weekeday lunches. Serve with plain jasmine rice, or, for special occasions, with saffron rice or coconut rice. Product of Thailand.